1) “The Fox” at Bodo’s. If you order “The Fox” by name at Bodo’s, expect blank stares. There is no such thing. But, there should be. In doing research for our article on Bodo’s, what we enjoyed most was learning owners’ and employees’ favorite ways to enjoy a Bodo’s bagel, which are listed at the end of the article. Those of us prone to a sausage-egg-and-cheese rut never imagined people were eating so creatively at Bodo’s. We have been working our way through the entire list, and our favorite remains the one from Bodo’s founder Brian Fox. 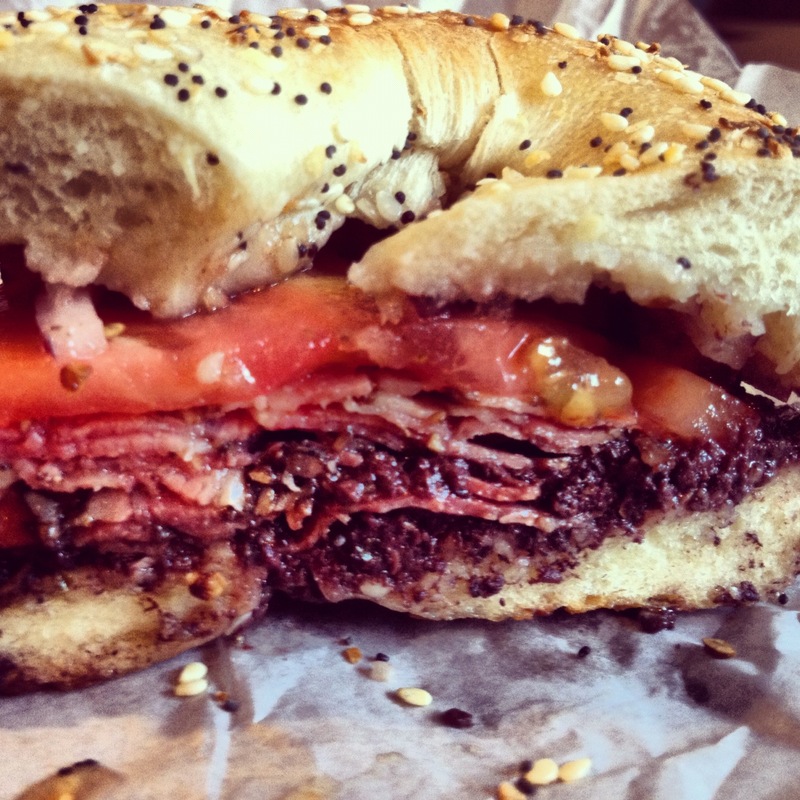 Pastrami on an everything bagel, with EZ kalamata olive spread, onions, and tomato, cut in half. It’s the best thing we can ever remember having at Charlottesville’s most popular restaurant. 2) Mousse de Foie de Volaille at Petit Pois. 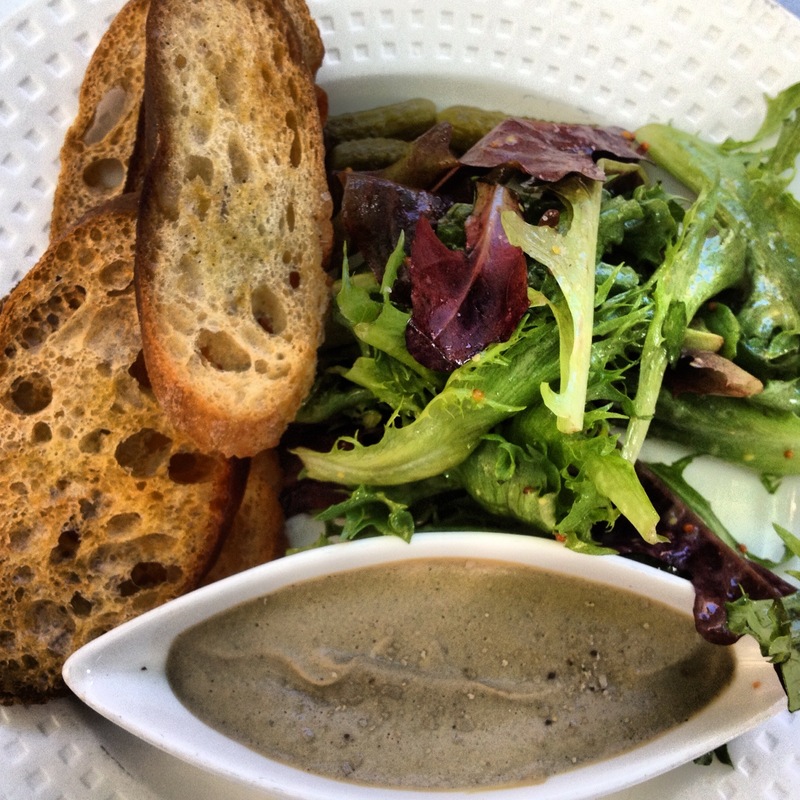 Polyface Farm chicken liver mousse with toast points and green salad. We have one regular out-of-town guest who is a chicken liver mousse fiend. Having tried the dish at countless restaurants, she still maintains that the version at Petit Pois is among the best she’s ever had. We would never dare allow a visit go by without a trip to Petit Pois. Having had it several times ourselves, we can understand the fixation. It makes an excellent light lunch on the patio with a glass of wine (or three) and people-watching on the downtown mall.